In Malawi early marriage is sadly very common. Child marriage puts girls at greater risk of dropping out of school, domestic violence and potential life-threatening health consequences of early pregnancy. All We Can is supporting work with teenage mothers in southern Malawi, enabling these young mums to get a second chance at an education. When she was just a teenager, Betina became pregnant, got married, and was forced to drop out of school. Her education had already been patchy and she struggled with even basic literacy and numeracy skills. Growing up in a rural region of southern Malawi, where poverty and a lack of opportunities for young people already make life difficult enough, Betina felt isolated and helpless. She struggled to get enough food for her growing family and, without any basic skills, she was forced to get by on piecemeal work and by labouring on a farm. The literacy rate in Malawi is considerably higher than in neighbouring countries, with 72 percent of young people aged 15 to 24 able to read, but this statistic really only tells half the story. The state of girls’ education in Malawi is in a critical condition. Girls like Betina still face cultural norms that promote early marriage, a lack of access to good sexual health education and a pressure on families to invest in sons rather than daughters. More than 40 percent of girls will be married in Malawi by the time they are 18 years old. Betina is now a happy and healthy young woman in her twenties, who is able to care for her children. 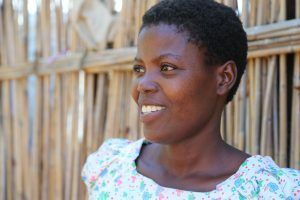 She was supported by a local organisation, with whom All We Can work in Malawi, to gain literacy and numeracy skills and was given advice on how to look after herself and her baby. Later, she received specialist vocational training as a seamstress. All We Can is now supporting young women like Betina to reach their full potential. Classes are held which enable girls to gain basic literacy and numeracy skills, equipping them to get back into school or to run a small business successfully.